Understanding the Threat (UTT) stormed Nebraska and Iowa last week speaking to several audiences and educating them about the threat of the Islamic Movement in the United States. Hamas (CAIR) supporters, including candidate for the Board of Supervisors democrat Glenn Hurst, came to disrupt the program, but the facts and evidence got through to the vast majority of the audience who absorbed the information and understood the threat. At least one jihadi sat in the front row among the protesters. The discredited anti-American Marxist group Southern Poverty Law Center (SPLC) also made attempts to have the event canceled. The overwhelming majority of the crowd came to listen and learn more about real threats to the community, but Marxists and jihadists are not about free speech, they are about controlling the message. Understanding the Threat was filming the event for a professional upcoming DVD, so the exchanges between Hamas (dba CAIR) and UTT is well-documented. For a snippet of the event, watch a 2 minute video HERE. 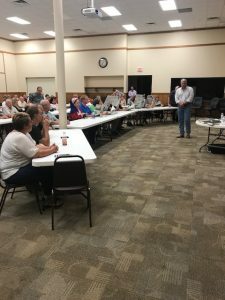 The Chairman of the Pottawattamie County GOP, Jeff Jorgensen, strongly supported the Understanding the Threat (UTT) presentation and demonstrated great courage. The rest of the county GOP, however, as well as the Iowa State GOP shied away from the event and went to great lengths to make sure they were not in support of what Mr. Jorgensen was doing. Through all of this, as usual, none of the detractors – including the local media – mentioned the Council on American Islamic Relations (CAIR) was identified by the U.S. government as being created by the U.S. Muslim Brotherhood’s Palestine Committee, which is Hamas in the United States. Nor was it mentioned by the media or others – besides UTT – that UTT’s Vice President Chris Gaubatz spent several months undercover at CAIR’s office in MD/VA and its headquarters in Washington, D.C. pulling over 12,000 documents out of their offices revealing CAIR is involved in criminal activity including fraud, sedition, and terrorism, among others. 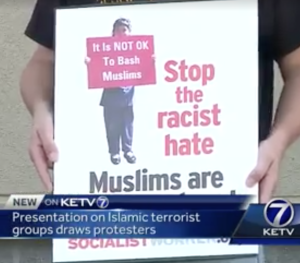 Those in attendance did come to learn that many of the Islamic centers/mosques and organizations around Nebraska and Iowa – the Islamic Center of Omaha and the Islamic Foundation of Lincoln for instance – are owned/controlled by the Muslim Brotherhood. Why, you might ask, would the Islamic and Marxist Movements care UTT is speaking to crowds in rural Iowa? Because the enemy is currently working in Iowa to influence Presidential elections and is not pleased UTT is spreading truth! The Global Faith Institute was founded by Dr. Mark Christian, a former muslim Imam who became a Christian and speaks frankly about the dangers of Islam. Dr. Christian made it clear the information UTT teaches about Islam is right on the mark. Pun intended. Another victory in this long battle. Many more to come. Great job guys. Keep up it up. God(YHVH) bless. I have a powerful place in my heart for the people of the Upper Midwest, so I thank you and all those who made your talk possible in Oakland, Iowa. You boldly shared the news about the threat that is lurking for all of us. It isn’t easy being a Cassandra, but it is vital work, and with God’s blessing, eyes and ears will be opened. Thanks to UTT for standing tall in taking the truth to Iowa. Like you did, all Americans must start pushing back on this Islamic Civilization Jihad taking place. Hello JG. 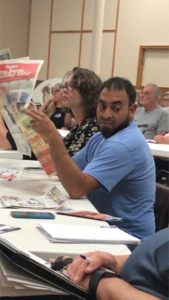 In protest they read the newspapaer to disrupt your meeting, I hope they were booted right out, how rude can they get….if not they had to suffer thru the facts…I don’t think I could have watched the antics without having the news papers removed or having them removed. It seems very simple to me that a disgruntled Mohammed hijacked parts or the Christian Religion, for a political and military fantasy. He wasn’t around untill some 624? years after Christ”s death and ascension!. A decendant of Abraham? Worship an idolic stone, of Abrahams? A revelation from Gabriel and from the same god? What temple did he ride off to? If our god wanted mayhem and murder,…wouldn’t he send the archangel…but that would break the final covenant, final sacrificial lamb of God (Jesus), which they deny? And although there were Arabs,…there were no Muslims before Mohammed! So you see, you can’t really coexist with a false profit that commits evil. Islam means submission to Mohammed and the false writings in the Quoran?, Hadiths,…A religion of peace? Which of you will deny Christ, “the Word”, “the I am” at your peril? Will you not stand up? Speak out?, Spread the Good News? Offer “A Path” to accepting real redemption only thru the Christ Jesus? Dr. Bill Warner has a very informative video which I share as often as possible.https://youtu.be/t_Qpy0mXg8Y Title is Why Are We Afraid; a 1400 Year Secret. Thank you for your work. Long live the Constitution!